There are few places in the United States with historical landscapes in Royse City as rich and diversified as Dallas. For most people, home lawn care is all about beautification, keeping up appearances and doing something good for the environment but is much more than just that. Yes, the primary goal may be for home decor and landscaping but when done well, lawn care can bring many more advantages for you and the family. A well maintained lawn, nicely trimmed and adequately watered will not only look good on the eye but it also improves the quality of your family’s social life. Taking good care of the lawn means you also put environmentally friendly chemicals to protect the lawn from plant diseases and insects alike. This means that your lawn will remain healthy and safe for the family and kids to use it for various activities. You can hang out by your front yard lawn and have a Sunday picnic; you could let your kids play some friendly sports knowing that they are fully protected when they fall. Since the lawn is well kept there will be no cases of insect bites and other irritations. Landscaping is part of property evaluation; before anyone looks inside your property they are greeted by the front yard and begin to calculate value from the state of the landscape. Having a good well taken care of lawn will boost the appearance of the whole landscape area and increase the value of your property. The environment benefits greatly from well-kept lawns. Healthy lawns develop incredibly deep roots which play an actively role in binding the soil together and prevent erosion from occurring. The roots also act as a water purification mechanism by trapping some impurities contained in water before it seeps into the ground towards the subsurface water table. In addition healthy lawns reduce air pollution by trapping impure particles like dust present in the air. This makes the air much more cleaner for the people to breathe, especially in the urban areas. Remember, healthy lawn care is not just cutting and watering the grass. 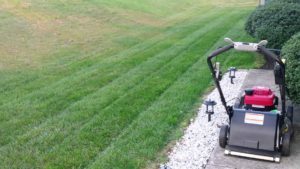 There are other indispensable acts like applying manure and chemicals that can prove to be the difference between ordinary lawn and that nice green fresh looking front yard. For your lawn to be healthy you need to maintain an optimum moisture level when you water it, weeds have to be carefully taken out without affecting the roots of the lawn. Application of pesticides and herbicides needs careful attention to detail because a slip and miss may affect the whole lawn. In as much as it is possible to do it yourself, it is imperative that you consult a reliable source for information on which products to buy and how to apply them to your loan. There are many kinds of fertilizers and types of manure that are applied in relation to the type of soil, knowing the right kind to apply can be difficult at times. There are some lawn and landscaping services that can come and have a look at your lawn and give you professional recommendations on how best you should go about your lawn care.